NEMO Fillo HQ Pillow. Thoughtful design does a much better job supporting your head than what you’ll find at the airport. 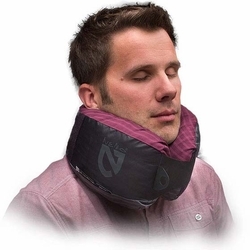 Adjustable to different head and neck sizes and not affected by changes in altitude like other air filled pillows. Super soft 50D microsuede polyester envelopes your neck in comfort.